An unaltered photocopy of your DD-214, ERB or ORBclearly displaying your award of the Army Reserve Component Overseas Training Ribbon. The Army Reserve Components Overseas Training Ribbon was established on July 11, 1984, by Secretary of the Army John O. Marsh, Jr. The Army Reserve Components Overseas Training Ribbon has been in effect since July 11, 1984. Eligibility based on training that took place prior to July 11, 1984 may be credited, provided the member has remained on active in the Army, National Guard, or Army Reserves subsequent to July 11, 1984. 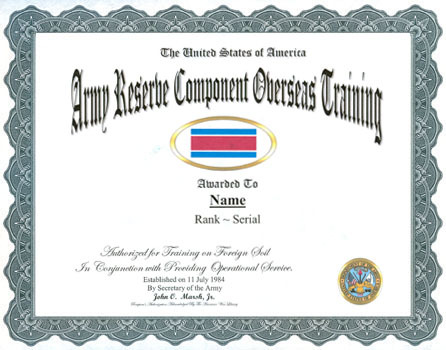 The Army Reserve Components Overseas Training Ribbon is awarded to all members of the U.S. Army Reserve Components (Army National Guard and Army Reserve) for successful completion of Annual Training or Active Duty for Training for a period not less than ten consecutive days on foreign soil. The service member must be credited with completion of at least ten consecutive duty days outside the 50 States, the District of Columbia, and U.S. possessions and territories in the performance of duties in conjunction with Active Army, joint services, or Allied Forces. 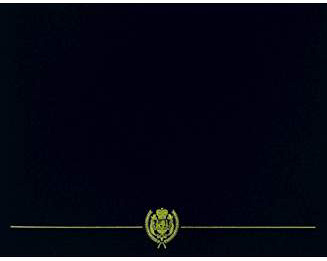 The Army Reserve Components Overseas Training Ribbon is worn after the Overseas Service Ribbon and before all foreign service medals and ribbons. Ribbon: Blue with a white-edged horizontal red stripe. Awarded: To all members of the U.S. Army Reserve Components (Army National Guard and Army Reserve) for successful completion of Annual Training or Active Duty for Training for a period not less than ten consecutive days on foreign soil.